Here is the ultimate set of tools to take your song from idea to finished, mixed and mastered track. It doesn't if you are in your bedroom, on a bus or in a multi-million dollar studio, this bundle is the ultimate vehicle to take your song from initial idea to a finished, mixed track. Here is how to find the perfect guitar or bass tone. Beef up your drums. Mix your lead and vocal overdubs, add ambient soundscapes and fine-tune your master. In total, approx. 300 professionally designed effect chain presets for the most essential elements in a production – all in one handy package. Add to this the already profound content in EZmix 2 and you have probably the most intuitive, low-footprint yet powerful set of mix tools on the market. 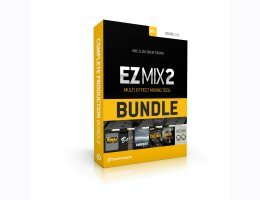 EZmix 2 is the core product, required for any EZmix Pack to operate. The EZmix 2 factory content includes amp/cab simulation for guitar and bass as well as a wide array of pro-designed signal chain settings for a multitude of mixing needs. The Ambient EZmix Pack is a collection of settings specifically aimed at creating large, reverberant soundscapes. A creative toolbox, perfect for use in atmospheric compositions spanning anything from motion picture scores to modern pop and awide array of other musical contexts. For the Amps EZmix Pack, we dove headfirst into the vaults of the the last few decades of guitar inspired music and came back out with a complete songwriting toolbox for anything from rock and blues to pop and country guitar. Need an 80s “Purple Rain”-esque sound? Call it up. Want a gritty twang guitar? Call it up. A soaring lead sound, a bluesy rhythm guitar or a fat rock bass? Call it up – it’s all in there with the other 50 pro-designed signal chains based on guitar/bass amp/cab simulation including effects and stomp box processing. The Drums Toolbox EZmix Pack features a wide variety of one-click settings specifically tailored to enhance drum recordings of any type, all designed by a dream team of engineers: Randy Staub (Metallica, Alice in Chains), Neil Dorfsman (Bruce Springsteen, Bob Dylan), Pelle Henricsson (Refused) and the sound design team at Toontrack. Regardless of genre, vocal style or preference, the single most identifiable ingredient in a mix is the lead vocals. It carries the tune, the melody and the words. It’s the undisputed, universal component that anyone can name and relate to. Sadly enough, it’s likely one of the hardest things to get right. A great vocal sound often involves a long chain of effects, compression, EQ and not to mention, the know-how and touch of an experienced engineer. This pack was designed by Toontrack co-founder and head of Sound Design, Mattias Eklund, and is best described as a virtual pantry chock-full of the sweetest of any and all things related to making lead vocals sound great and sit well in any mix. All mixes deserve proper mastering! This pack was designed by Mats "Limpan" Lindfors, senior engineer at Cutting Room, the leading mastering studio in Scandinavia. It aims to cover the most common mastering needs and music genres.